Jingle all the way toBCO's 2018 Holiday Party (and Dinner). 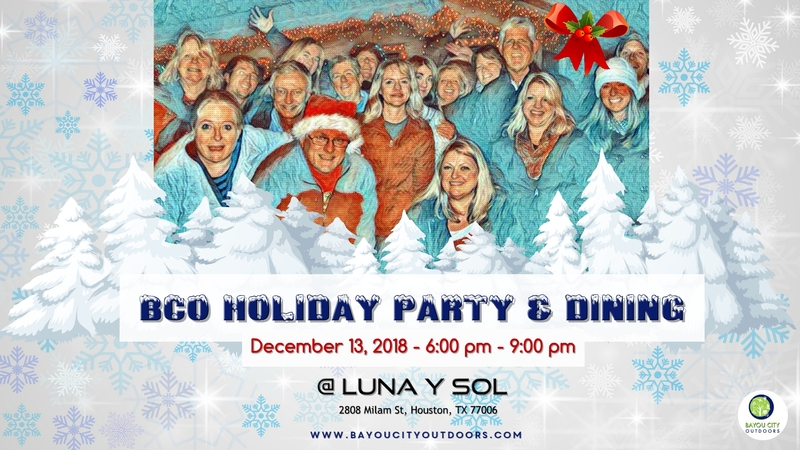 Luna y Sol has closed the doors to everyone but BCO so we've got the place to ourselves so come to celebrate the holidays with your BCO Buddies. If you haven't been to Luna y Sol yet, here's what you should know...the family celebrates traditional Mexico food and the head chef (and mom) is a Cordon Blue trained! Expect over the top margaritas, authentic mole and decorations galore! Yes, it's in Midtown and NO Parking problems here! There is some parking in the lot in front of the restaurant and then lots of parking on the rooftop of the adjacent garage (you will see the garage ramp to the right as you face the front door of the restaurant). Can't wait to see everyone there! Please RSVP early as there is limited space. Friends For Lifeis the fastest growing No Kill animal adoption and rescue organization in Houston, dedicated to offering No Kill solutions to the animals of Houston and the people who want to help them. Their programs include rescue, rehabilitation, adoption, humane education and animal food/supply support.